SunEthanol, a company that is developing microbes to produce cellulosic ethanol, announced on Nov. 18 that has raised $25 million in Series B financing and that it is changing its name to Qteros Inc. The funding will allow the company to scale up its process from the pilot plant to commercial operations, and hire additional engineers and scientists, company officials said. Plans call for a demonstration plant by 2010 and commercial production in 2011. The two year old Hadley, MA company is developing the Q Microbe™ (Clostridium phytofermentans), a lollipop-shaped microscopic organism that the company claims has unique properties that make it ideally suited to the production of cellulosic ethanol from a variety of non-food plant materials. Dr. Susan Leschine, Qteros’ Chief Scientist and co-founder, is the University of Massachusetts, Amherst microbiology professor who, nearly 10 years ago, first collected a sample of the Q Microbe™ near the Quabbin Reservoir in Massachusetts. The Q Microbe, was nearly perfect for the job, as found in nature, with an unusual ability to dynamically adjusts to the type of organic matter it’s processing; the company is only engaged in “classical genetic engineering”, which basically means selective breeding. Currently, throughout the industry, the largest cost components are the feedstock and the enzymes used for the bioconversion. The Complete Cellulose Conversion (C3) process (formerly the Q process) can use very low cost feedstocks and does not use any enzymes. With only one-step of bioconversion, the C3 process is much more efficient—and less costly—than other conversions now in use. Its Q Microbe™ simplifies the process, eliminating the need for a separate enzymatic breakdown step. Instead of the conventional enzyme and yeast process, C3 technology consolidates multiple steps into a single bioconversion step, resulting in a lower cost of production. This process is less costly than conventional corn starch–production technology and allows for the use of many types of plant material. General Motors Corp. and Mascoma Corp. today announced a strategic relationship to develop cellulosic ethanol focused on Mascoma's single-step biochemical conversion of non-grain biomass into low-carbon alternative fuels to help address increasing energy demand. Mascoma's single-step cellulose-to-ethanol method, called Consolidated Bioprocessing, or CBP, lowers costs by limiting additives and enzymes used in other biochemical processes. The relationship, which includes an undisclosed equity investment by GM, complements an earlier investment in cellulosic ethanol startup Coskata that uses a thermo-chemical process to make ethanol from non-grain sources. "Taken together, these technologies represent what we see as the best in the cellulosic ethanol future and cover the spectrum in science and commercialization. Demonstrating the viability of sustainable non-grain based ethanol is critical to developing the infrastructure to support the flex-fuel vehicle market. One of the things that attracted us to Mascoma was its R&D team. Their development of best-in-class microorganisms and enzymes could lead a transformation to a new era of biofuels." cellulosic ethanol production. Planting will take place within the next 45 days. Switchgrass is a perennial grass that is naturally drought resistant and grows on marginal lands.The Oklahoma Bioenergy Center (OBC), demonstration fields will provide academia and industry a unique "living laboratory" to understand the production and long-term impact of bioenergy crops, as well as experiment with new production techniques and critical harvest, collection and transport methods. The critical piece of this effort is 1,000 acres of switchgrass which will be planted near Guymon, Okla. in the state's panhandle. This switchgrass field will be the first of its size anywhere in the world focused on biomass production. Additional acreage of sorghum and switchgrass will be planted near Chickasha and Maysville in central Oklahoma. A cellulosic biorefinery currently being constructed by Abengoa Boenergy in Hugoton, Kan., will be less than 35 miles from Guymon, and the switchgrass fields in the panhandle will provide material to this biorefinery. The Abengoa Bioenergy facility is expected to be operational in 2010. 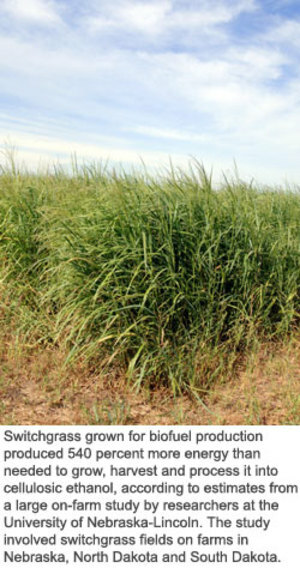 This will be a major step in the production of bioenergy from switchgrass. While it may seem to be a rather trivial matter, until it is demonstrated that the switchgrass can be successfully harvested at an economic cost, the use of switchgrass for this purpose is in question. Plantings for other uses of switchgrass are unlikely to provide this information as they are generally not harvested and the yield is not of such concern. Some small demonstrations have been made, but they are not necessarily applicable to larger stands. The harvesting and any other questions about growing the switchgrass could delay the use of switchgrass, 1) by eliminating the need for a commercial grower to go through this step 2) to show financial backers of switchgrass bioenergy facilities that this step is not a problem 3) to shorten the time before switchgrass is accepted as a viable feedstock for bioenergy and 4) To determine the optimum planting density to obtain the best yield per acre as numbers for this vary greatly. University of Maryland research that started with bacteria from the Chesapeake Bay has led to the development of a bacterium, called Saccharophagus degradans which can break down almost any source of biomass, or plant life, into sugars, which can then be converted into ethanol and other biofuels. That process, developed by University of Maryland professors Steve Hutcheson and Ron Weiner, professors of cell biology and molecular genetics, is the foundation of their incubator company Zymetis. They discovered how to produce the enzyme in their own laboratories. The result was Ethazyme, a bacterium that creates a mixture of enzymes—through a patent-pending system which degrades the tough cell walls of cellulosic materials into bio-fuel ready sugars in one step, which are then converted into ethanol and other biofuels at a significantly lower cost and with fewer caustic chemicals than current methods. -- Steve Hutcheson, CEO of Zymetis Inc.
U.S. Department of Energy (DOE) on Feb. 26 announced that DOE will invest up to $33.8 million, over four years, for four projects that will focus on developing improved enzyme systems to convert cellulosic material into sugars suitable for production of biofuels. Combined with industry cost share, up to $70 million will be invested in these projects, with a minimum 50 percent cost share from industry. Cellulosic ethanol can be made from a wide variety of non-food materials, including agricultural wastes such as corn stover and cereal straws, industrial plant waste like saw dust and paper pulp, and energy crops such as switchgrass, specifically for fuel production. By relying on a variety of feedstocks, cellulosic ethanol can be produced in nearly every region of the country, using material grown locally. Though it requires a more complex refining process, cellulosic ethanol contains more net energy and results in lower greenhouse emissions than traditional corn-based ethanol. Another company is entering the Cellulosic ethanol market place with the announcement that AE Biofuels, Cupertino, CA, has begun construction of an integrated cellulose and starch ethanol commercial demonstration facility in Butte, Montana. The plant will use proven patent-pending Ambient Temperature Cellulose Starch Hydrolysis (ATCSH) enzyme technology to optimize process conditions for multiple feedstocks. Non-food ethanol feedstocks used by the facility are expected to include switch grass, grass seed straw, small grain straw, and corn stalks alone and in combination with a variety of traditional starch and sugar sources. 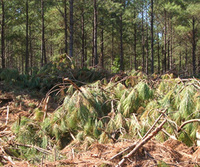 The 9,000 square foot pilot plant facility is expected to be fully operational in the second calendar quarter of 2008. In 2007, AE Biofuels™ acquired enzyme technology from Renewable Technology Corporation and formed its ethanol technology subsidiary, Energy Enzymes. The company’s low-cost, multi-activity enzyme technology is designed to reduce operating and capital costs for both cellulosic ethanol and starch ethanol plants and provides a platform to integrate the two processes. AE Biofuels utilizes patent-pending ambient temperature enzymes to eliminate the up-front “cooking” process that occurs in traditional starch ethanol production. The company has three patents pending for the use and implementation of its technology. The key to the integrated process is AE Biofuels’ patent pending ATSH process. The ATSH converts starch to sugar without the cooking step of conventional corn plants. ATSH enzymes convert the raw starch to sugar at ambient temperatures. Eliminating the cooking step allows the beer from the cellulosic fermentation process to be used as the starch process water, increasing the overall alcohol concentration of the final beer and reducing water use, energy use and feedstock costs. This technology is a endorsement of enzyme technology as a viable means of producing cellulosic ethanol, if it meets the companies claims. The elimination of process steps, low cost enzymes and reduced cooling water consumption are all keys to lower cost cellulosic ethanol. Syntec Biofuel Inc (OTCBB: 'SYBF'), a company developing biomass to fuel conversion technologies, announced that it has achieved a yield of 105 gallons of alcohol (ethanol, methanol, n-butanol and n-propanol) per ton of biomass. This marks a major milestone for Syntec as this yield is equivalent to revenues in excess of $27 million per year for a 300 ton per day biomass processing facility. Syntec's technology is based on thermo-chemical conversion of syngas, produced by gasifying biomass, and passing the gas over the catalysts in a fixed bed reactor. This process is similar to producing methanol which is an established and well known technology. -- Michael Jackson, President of Syntec Biofuel Inc. The Syntec B2A technology,is focused on second-generation cellulosic ethanol production. Syntec’s innovative technology uses any renewable waste biomass such as hard or soft wood, sawdust or bark, organic waste, agricultural waste (including sugar cane bagasse and corn stover), and switch-grass to produce syngas. DOE announced on January 29 that it will invest $114 million in four ten-percent of commercial-scale scale biorefinery projects over four years, to be located in Colorado, Missouri, Oregon, and Wisconsin. Expected to be operational in four years, the selected projects will use a wide range of feedstocks to produce liquid transportation fuels such as cellulosic ethanol, as well as bio-based chemicals and bio-based products used in industrial applications. Combined with industry cost share, more than $331 million will be invested in these four projects. “Spurred by the President’s ambitious plan to reduce projected U.S. gas consumption by twenty percent by 2017, our goal is to aggressively push these technologies forward to get them out into the marketplace as quickly as possible, so they can have a real impact. Advanced biofuels offer tremendous promise for helping our nation to bring about a new, cleaner, more secure and affordable energy future.”On average, commercial-scale biorefineries input 700 tons of feedstock per day, with an output of approximately 20-30 million gallons a year (MMGY); these small-scale facilities will input approximately 70 tons of feedstock per day, with an typical output of 2.5 MMGY. General Motors is investing in Coskata, a start-up biofuels company that says it can produce ethanol from a wide range of feedstocks for less than $1.00 per gal, compared with a wholesale selling price of more than $2.00 per gal today. 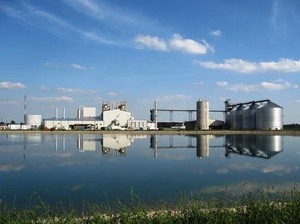 GM will receive the first ethanol from Coskata’s pilot plant in the fourth quarter of 2008. Acccording to Chemical & Engineering News the first commercial-scale plant will be running in 2011, making 50 million to 100 million gal of ethanol (per year). Coskata’s process is feedstock flexible, and enables the use of cost-effective, locally abundant materials to achieve the lowest ethanol production cost targets in the industry. This groundbreaking approach addresses many of the constraints lodged against current renewable energy options, including environmental, transportation and land use concerns. On November 6, 2007 Range Fuels broke ground, on what it claims is the nation’s first commercial cellulosic ethanol plant located near Soperton, Georgia. Range Fuels, one of six companies selected by the Department of Energy (DOE) for financial support in building a commercial cellulosic ethanol plant, will be the first to break ground. The Range Fuels process accommodates a wide range of organic feedstocks of various types, sizes, and moisture contents. This flexibility eliminates commercial problems related to fluctuations in feed material quality and ensures success in the real world, far from laboratory-controlled conditions. The first plant focuses on utilizing leftover wood residues from timber harvesting that serve no useful purpose, converting them to about 20 million gallons of ethanol and other alcohols per year, initially. By the time they ramp up to full-scale operations at the Soperton Plant, the plant is projected to produce up to 100 million gallons of ethanol each year. Biomass (all plant and plant-derived material) that cannot be used for food, such as agricultural waste, is fed into a converter. Using heat, pressure, and steam the feedstock is converted into synthesis gas (syngas), which is cleaned before entering the second step. The cleaned syngas is passed over their proprietary catalyst and transformed into mixed alcohols. These alcohols are then separated and processed to maximize the yield of ethanol of a quality suitable for use in fueling vehicles. Mascoma Corporation, a developer of proceses to produce biofuels from lignocellulosic biomass using proprietary microorganisms and enzymes, announced the acquisition of Celsys BioFuels, Inc.
. . . Celsys BioFuels, Inc., . . .was formed . . . to commercialize cellulosic ethanol production . . . using technology developed . . . at Purdue University. The Celsys technology is based on proprietary pretreatment processes for multiple biomass feedstocks, including corn fiber and distiller grains. . . .
Genencor, a division of Danisco A/S, announced on Oct. 15, a new product, Accellerase™ 1000, the first ever commercially available biomass enzyme developed specifically for second generation biorefineries. Accellerase™ 1000 contains a potent complex of enzymes that reduces complex lignocellulosic biomass into fermentable sugars -- an indispensable step for the production of cellulosic ethanol. . . . Enhanced saccharification performance on a variety of feedstocks. Ability to operate in simultaneous saccharification and fermentation (SSF) processes, two step sequential hydrolysis and fermentation (SHF) processes or hybrids of the two. High ß-glucosidase activity to minimize residual cellobiose, which may lead to a higher saccharification and ultimately to a faster ethanol fermentation. Yields may also be improved. Unclarified product. The remaining nutrients from enzyme production are available to the yeast in addition to the fermentable sugars produced by saccharification. Minimal formulation to ensure that enzyme formulation chemicals do not interfere with saccharification carbohydrate profile analysis or subsequent yeast fermentation. . . .
On a blackboard, it looks so simple: Take a plant and extract the cellulose. Add some enzymes and convert the cellulose molecules into sugars. Ferment the sugar into alcohol. Then distill the alcohol into fuel. One, two, three, four — and we're powering our cars with lawn cuttings, wood chips, and prairie grasses instead of Middle East oil. . . . While researchers work to bring down the costs of alternative energy sources, in the past two years policymakers have finally reached consensus that it's time to move past oil. . . . But how? Hydrogen is too far-out, and it's no easy task to power our cars with wind- or solar-generated electricity. The answer, then, is ethanol. . . .
Cellulosic ethanol, in theory, is a much better bet. Most of the plant species suitable for producing this kind of ethanol — like switchgrass, a fast- growing plant found throughout the Great Plains, and farmed poplar trees — aren't food crops. . . .
Companies featured are Lee Lynds Mascoma, Novozymes, and Verenium. And even ardent proponents concede that cellulosic ethanol won't solve our fuel problems — or do much to stop global warming — without parallel efforts to improve vehicle efficiency. Thanks to tip from the R-Squared Energy Blog. On September 14 POET Biorefining, formerly the Broin Companies, opened their 21st ethanol production facility, a 65 million gallon per year plant that brings Poet's total capacity to 1.1 billion gallons per year of corn ethanol, making POET the largest producer of ethanol in the world. The facility, the 27th (including administrative facilites) constructed by POET since they were founded 20 years ago, is equipped with technology that decreases its environmental footprint. That technology includes POET’s patent-pending BPX™ process that eliminates the need for heat in the cooking process of producing ethanol, reducing energy usage by 8-15 percent in comparison with conventional plants. It will also be outfitted with a regenerative thermal oxidizer that eliminates up to 99.9 percent of air emissions. The BPX process is a patent-pending raw starch hydrolysis process that converts starch to sugar, which then ferments to ethanol without heat. The process not only reduces energy costs, but also releases additional starch content for conversion to ethanol, increases protein content and quality of co-products, increases co-product flowability, potentially increases plant throughput and significantly decreases plant emissions. POET Biorefining - Portland, IN will utilize 22 million bushels of corn from the area to produce 65 million gallons of ethanol and 178,000 tons of Dakota Gold Enhanced Nutrition Distillers Products™ per year. The $105 million facility will provide around 40 jobs with an annual payroll of about $2 million. Novozymes has concluded a development agreement with CTC, the Brazilian sugar cane industry’s technical center. Under this agreement Novozymes will contribute enzyme technology for developing bioethanol from bagasse. The agreement with CTC (Centro de Tecnologia Canavieira) is a research collaboration with a view to developing bioethanol from bagasse – a residual product of sugar production from sugar cane. The development work will take place in a close collaboration between CTC and Novozymes in Brazil, aided by Novozymes’ R&D centers in the US and Denmark. This future process will enable higher ethanol yield in the production process from sugar cane and will thereby optimize the process economy and energy balance and will also reduce the land use and emission of green house gases further. FPL Energy, LLC, a subsidiary of FPL Group (NYSE: FPL), announced on Thursday that it has signed a letter of intent with Citrus Energy, LLC, of Boca Raton, FL, to develop the first ever commercial scale citrus peel to ethanol plant. The cellulosic ethanol plant will be owned and operated by FPL Energy and is expected to produce four million gallons of ethanol per year. It will be located on the grounds of a local Florida citrus processor. "Citrus Energy's mission is to develop fuel ethanol that minimizes environmental impact and cost by using citrus waste and other biomass. FPL Energy, as the largest renewable energy generator in the U.S., is the ideal partner," said David Stewart, president of Citrus Energy. Massachusetts-based company Mascoma will build a cellulosic ethanol plant in Michigan in its race to be the first in the nation to produce ethanol from wood on a commercial scale. The cellulosic plant will make ethanol mainly from wood chips and other non-food agricultural crops. Because cellulosic ethanol production uses non-food agricultural feedstock, it is critical to producing ethanol on a scale that could substitute for imported oil. Mascoma Corporation is a low-carbon cellulosic biomass-to-ethanol company with corporate offices in Cambridge, Massachusetts, and a R & D facilities in Lebanon, New Hampshire. Mascoma has developed an enzymatic process. It is continuing to develop advanced technologies in its own laboratory with Professor Lee Lynd at Dartmouth College’s Thayer School of Engineering by licensing “best in class” microorganisms and enzymes, and with other sponsored research around the world. It is also developing demonstration and commercial scale production facilities in several locations. Miscanthus -- A Solution to U.S. Dependence on Foreign Oil? Stephen Long and his graduate student Emily Heaton, left, have been conducting side-by-side comparisons of switchgrass to the European miscanthus (previous post) since 2002 at the University of Illinois. 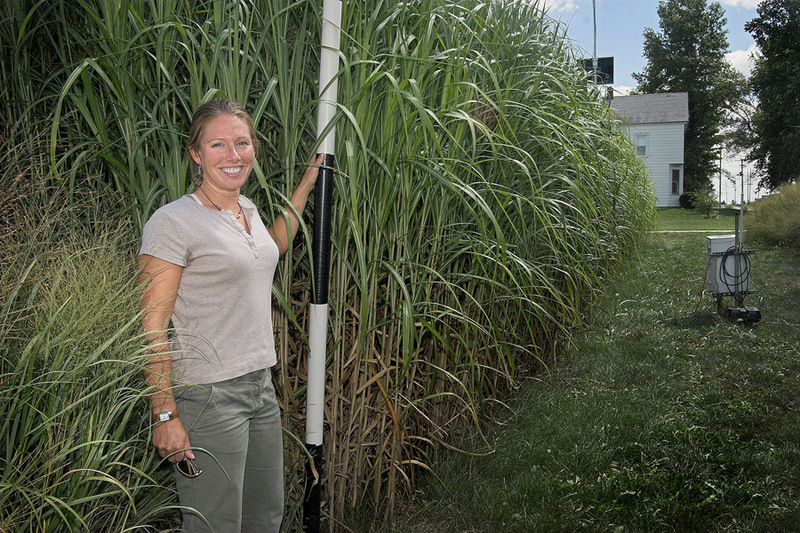 "Our results show that with miscanthus the President's goal of replacing 30 percent of foreign oil with ethanol, derived from agricultural wastes and switchgrass by 2030, could be achieved sooner and with less land." Heaton said that because of the high yields with minimal inputs farmers would make a profit if they received about $20 per ton to make a profit. Dry, leafless Miscanthus, the cool-weather-friendly perennial grass, sometimes referred to as elephant grass or E-grass, grows from an underground stem-like organ called a rhizome. Miscanthus, a crop native to Asia and a relative of sugarcane, drops its slender leaves in the winter, leaving behind tall bamboo-like stems that can be harvested in early spring and burned for fuel. Range Fuels Gets Costruction Permit for First Large Scale Cellulosic Ethanol Plant. This week Range Fuels was awarded a construction permit from the state of Georgia to build the first commercial-scale cellulosic ethanol plant in the United States. Ground breaking will take place this summer in Treutlen County, Georgia for a 100-million-gallon-per-year cellulosic ethanol plant that will use wood waste from Georgia's forests as its feedstock. Phase 1 of the plant is scheduled to complete construction in 2008 with a production capacity of 20 million gallons a year. The company estimates that this plant – combined with others to follow – will have the capacity to produce over 1 billion gallons of ethanol per year. The company's technology completely eliminates enzymes which have been an expensive component of cellulosic ethanol production. The process is self-sustaining, produces virtually no waste products, emits very low levels of greenhouse gases, and produces high yields of ethanol. The thermo-chemical conversion process, the K2 system, uses a two step process to convert the biomass to synthesis gas, and then the syngas is passed over a catalyst and transformed into alcohols. The process accommodates a wide range of organic feedstocks of various types, sizes, and moisture contents. See previous post for details on the company. Diversa Corporation and Celunol Corp. announced today that they have completed their previously-announced merger transaction to create a new leader in the global biofuels industry. 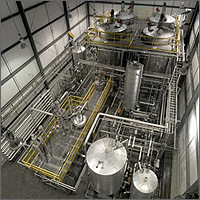 The combined company, which has been renamed Verenium Corporation (Nasdaq: VRNM), possesses a growing portfolio of specialty enzyme products and unique technical and operational capabilities designed to enable the production of low-cost, biomass-derived sugars for a multitude of major industrial applications. The most significant near-term commercial opportunity for Verenium will be the large-scale commercial production of cellulosic ethanol derived from multiple biomass feedstocks. "Verenium is now positioned to be a vertically-integrated leader in the rapidly-evolving worldwide biofuels industry through the unique combination of assets, technologies, and personnel resulting from this merger. We believe that commercial success in this industry requires broad R&D capabilities and asset development expertise, which we have now brought together within one, highly-focused company, Verenium Corporation," said Carlos A. Riva, President and Chief Executive Officer of Verenium. Verenium has made significant advances in the production of cellulosic ethanol over the past several years, greatly improving the likelihood that it will become a commercial reality in the very near future. In particular, they are using proprietary and unique micro-organisms, called ethanologens, to ferment cellulose and hemicellulose from multiple feedstocks into ethanol. Brazil's Dedini SA, a leading manufacturer of sugar and biofuel equipment, has announced that it has demonstrated a cellulosic ethanol process on an industrial scale, a development that could revolutionize the industry by boosting the competitiveness and energy balance of biofuels. Dedini's São Luiz Mill in São Paulo state began producing cellulose ethanol from bagasse - the leftover cane stalk after the sucrose is pressed out - at about US$ 40 cents a liter in 2002. Production costs have now fallen, due to improvements in processing technologies, to below €20/US$ 27 cents a liter (US$ 1.02 per gallon). "This means the fuel is cost-competitive with oil at US$42 a barrel," said Dedini Operations Vice President José Luiz Olivério at the seminar. Further commenting, Oliverio said "this will be able to boost a mill's ethanol output by 30 percent without planting one more cane stalk". In short, a hectare of sugar cane will deliver a third more ethanol and now yield up to 9000 liters, three to four times more than corn. The reason is simple: Feedstock costs alone account for a full 75% to 80% of the cost of ethanol produced from residual biomass, whether it comes from sugarcane, wood chips, switchgrass or corn husks, said Isaias de Carvalho Macedo, a researcher at the country's Interdisciplinary Center for Energy Planning, or NIPE, at the University of Campinas. At the same time, Brazil already has much of the logistical infrastructure in place to collect the excess sugarcane mass, or bagasse, which will also cut down on initial costs, said Helena Chum, a senior adviser at the U.S. National Renewable Energy Lab. "In the U.S the harvesting of corn stover and all that infrastructure still needs to be put in place," she said. "Here in Brazil, it already exists." Together, Brazil and the U.S. jointly produce more than 70% of the world's ethanol. However, Brazil is the world's lowest-cost ethanol producer and the leading ethanol exporter. If new ethanol technologies take off, Brazil could almost double its ethanol output - set to hit over 20 billion liters in the ongoing 2007-08 season - to 36 billion liters per harvest, without expanding planted area beyond its current 6 million hectares, said Nilson Zaramella Boeta, the head director of Brazil's leading private cane research center, the Center for Cane Technology, or CTC. Just a handful of years back, it cost $6 per gallon to produce ethanol from residual biomass in the U.S., Chum said. "Now it's fallen to about $3 per gallon in 2007, while the cost of producing enzymes has fallen 20-fold in the past four years," she said. "Enzymes have to cost about 5 U.S. cents per liter here in Brazil, just for us to begin thinking of its economic viability," said Elba P.S. Bon, the scientific coordinator of Brazil's Bioethanol Project. "Right now, 12.4 U.S. cents per liter," she added. By 2012, if the cost-cutting trend continues, the cost of producing ethanol via cellulosic technologies could slip to a cost-effective $1 per gallon, said Chum. Mascoma Corporation, one of the leading cellulosic biomass-to-biofuels companies, previous post, today announced former United States Senator Tom Daschle has joined the company’s Board of Directors. Previously, he served more than 25 years in the U.S. House of Representatives and Senate where he acted as both Senate Minority and Majority Leader for 10 years. He is a longtime ethanol advocate who has sponsored legislation and led Congressional measures to advance the renewable fuels industry. Founded by Prof. Charles Wyman, Prof. Robert Johnson, and Prof. Lee Lynd of Dartmouth College and a portfolio of licensed technologies from Dartmouth College the companies research laboratories are now developing a new generation of enzymes, microbes and processes for economical conversion of cellulosic feedstocks into ethanol. It is aggressively pursuing the development of advanced cellulosic ethanol technologies based on work developed in Professor Lee Lynd’s labs at Dartmouth College. Mascoma’s industry-leading R&D is focused on reducing the biologically mediated steps in ethanol production to a single step. The combination of Mascoma's excellent technology with Daschle and his longtime political experience and Vinod Kholsa's investment expertise make a powerful team that will be hard to beat in the cellulosic ethanol field. The U.S. Department of Energy (DOE) on May 1 announced that it will provide up to $200 million, over five years (FY’07-’11) to support the development of small-scale cellulosic biorefineries. This funding announcement seeks projects to develop biorefineries at ten percent of commercial scale that produce liquid transportation fuels such as ethanol, as well as bio-based chemicals and bioproducts used in industrial applications. Small-scale projects will use novel approaches and a variety of cellulosic feedstocks to test new refining processes. These projects complement DOE’s announcement earlier this year, previous post, which makes available up to $385 million over four years for the development of six full-scale biorefineries. The full-scale biorefineries focus on near-term commercial processes, while the small-scale facilities will experiment with new feedstocks and processing technologies. Combined, these small- and full-scale projects will receive up to $585 million in federal investment. DOE's Joint Genome Institute (JGI) achieved a key milestone to understanding fermentative organisms by sequencing the genome for the fungus Pichia stipitis. The fungus is proficient at fermenting xylose, one of the main sugars in cellulosic biomass. The research performed in collaboration with the U.S. Forest Service's Forest Product Laboratory (FPL) identified numerous genes in the fungus that allow it to break down cellulose and ferment the xylose. The researchers also analyzed the metabolic pathways associated with those genes. P. stipitis is the most proficient microbial fermenter in nature of the five-carbon "wood sugar" xylose--abundant in hardwoods and agricultural leftovers, which represent a motherlode of bioenergy fodder. "The information embedded in the genome sequence of Pichia has helped us identify several gene targets to improve xylose metabolism," said Thomas W. Jeffries of the Forest Products Laboratory in Madison, Wisconsin. "We are now engineering these genes to increase ethanol production." Jeffries said that yeast strains like Pichia have evolved to cope with the oxygen-limited environment rich in partially digested wood that is encountered in the gut of insects, from where the sequenced strain was originally isolated. FPL has a Cooperative Research and Development Agreement (CRADA) in place with a New York City-based bioenergy company, Xethanol Corporation, which plans to integrate Dr. Jeffries' findings into its large-scale biofuels production processes. Five projects will receive $23 million over the next four years from DOE's Office of Energy Efficiency and Renewable Energy (EERE), to develop highly efficient fermentative organisms that convert cellulosic biomass into ethanol. Organisms that can ferment these cellulosic biomass materials into ethanol are crucial to the success of commercial-scale integrated biorefineries and cellulosic ethanol refining. Such organisms must be able to survive a wide range of environmental conditions while resisting mutations that would hinder their effectiveness. Cargill Incorporated, Celunol Corporation, DuPont, Mascoma Corporation, and Purdue University were selected for the five projects. Combined with the industry cost share, more than $37 million could be invested in these projects. To make cellulosic ethanol (or ethanol from non-grain biomass resources) cost competitive with gasoline by 2012. To replace 30 percent of current levels of gasoline consumption with biofuels by 2030 (or 30x30). Busness Wire News Release -- A top venture capitalist and a prominent biotechnology industry business consultant today both said that the biofuels industry is poised for exceptional growth and that ethanol from cellulose appears to be the most promising alternative fuel over the long-term. During keynote speeches at the World Congress on Industrial Biotechnology and Bioprocessing, Vinod Khosla of Khosla Ventures and Dr. Jens Riese of McKinsey & Co. also highlighted the significant reductions in greenhouse gas emissions achievable with ethanol from cellulose. The fourth annual World Congress runs March 21-24 at the Walt Disney World Swan and Dolphin Resort in Orlando, Fla. In a speech titled “The Role of Venture Capital in Developing Cellulosic Ethanol,” Khosla outlined the range of technologies currently being commercialized to convert cellulosic biomass to transportation fuels. Khosla said that the U.S. Department of Energy’s recent grants to cooperatively fund biorefineries that produce ethanol from cellulose is an acknowledgment that the technology is moving faster than expected. He said that a 100 percent replacement of petroleum transportation fuels with biofuels is achievable, and predicted that ethanol from cellulose technology will be cost competitive with current ethanol production by 2009. At the 4th Annual World Congress on Industrial Biotechnology and Bioprocessing in Orlando, Fla., Novozymes (Other OTC:NVZMY.PK) yesterday introduced a five-step strategy to achieve economically viable cellulosic ethanol. 1. Continued funding of research and development (specifically in the areas of biomass conversion and the development of a commercial process technology). 2. Establishment of flexible configuration testing and development centers, geographically distributed to address multiple types of biomass feedstock and integrate processes (pretreatment, hydrolysis and fermentation). BlueFire Ethanol (OTC: BFRE.pk) has released further information about its up to $40 million grant from DOE's cellulosic ethanol grant program to develop a solid waste biorefinery using their concentrated acid hydrolysis process at a landfill in Southern California. The Southern California Biorefinery Project will turn green waste and wood residues at landfills into about 19 million gallons of fuel grade ethanol per year. Additional products that will also be sold include lignin, gypsum, and yeast. BlueFires's current production estimates for the project will be significantly lower that DOE's cellulosic ethanol goal of $1.07/gal in production costs by 2012, and DOE's current estimate of approximately $2.26/gal. Construction is expected to begin by the end of this year with start-up expected on or before the end of 2009. Because it's process captures the more potent greenhouse gas methane as part of its process as well as provide renewable fuel, BlueFire will reduce greenhouse gases that cause global warming. Further information about BlueFire's can be found at previous posts, here and here. Based on the response to this mornings post on the governments cellulosic ethanol program, I think some of you may have misunderstood the reasoning behind The Energy Blog supporting this cellulosic ethanol program and some of the basic causes and remedies of The Energy Revolution. Our most pressing energy problem is our decreasing supplies of increasingly expensive oil for the transportation industries. The high use of petroleum products for transportation is one of the primary causes of global warming (the other being coal fired power plants, which will not be discussed in this post), fortunately the solution to the problem of increased use of petroleum products also decreases the emissions of global warming gases. This is not a short term problem, but one that has taken years to develop and will take years to solve. The timing is hard to pin down. I believe we have passed the peak production of inexpensive sweet crude oil. Each year we are now using larger quantities of expensive (either to harvest and/or refine) oil, whether it be sour oil, very deep offshore oil, heavy oil or perhaps eventually shale oil. At some time, as prices of oil go up, market forces will cause the use of oil to decrease. This would require changes in lifestyle, some of which would be beneficial, as there is much waste and some of which could reduce the the standard of living that we have become used to. More use of mass transportation and driving more efficient vehicles are certainly required. U.S. Department of Energy (DOE) Secretary Samuel W. Bodman announced on February 28 that DOE will invest up to $385 million for six biorefinery projects over the next four years to help bring cellulosic ethanol to market and help revolutionize the industry. When fully operational, the biorefineries are expected to produce more than 130 million gallons of cellulosic ethanol per year. This production will help further President Bush’s goal of making cellulosic ethanol cost-competitive with gasoline by 2012 and, along with increased automobile fuel efficiency, reduce America’s gasoline consumption by 20 percent in ten years. The solicitation, announced a year ago, was initially for three biorefineries and $160 million. However, in an effort to expedite the goals of President Bush’s Advanced Energy Initiative and help achieve the goals of his Twenty in Ten Initiative, within authority of the Energy Policy Act of 2005 (EPAct 2005), Section 932, Secretary Bodman raised the funding ceiling. Combined with the industry cost share, more than $1.2 billion will be invested in these six biorefineries. Negotiations between the selected companies and DOE will begin immediately to determine final project plans and funding levels. Funding will begin this fiscal year and run through FY 2010. A powerful company with a comprehensive basket of capabilities in the cellulosic ethanol industry has been formed by the signing of a definitive merger agreement between Diversa Corporation (NASDAQ: DVSA) and Celunol Corporation. On a pro-forma, fully diluted basis, Diversa stockholders will retain ownership of approximately 76 percent of the combined company, and Celunol stockholders and option holders will own approximately 24 percent. The transaction is expected to be completed by the end of the second quarter of 2007. The combined company will possess integrated end-to-end capabilities in pre-treatment, novel enzyme development, fermentation, engineering, and project development. It will seek to build a global enterprise as a leading producer of cellulosic ethanol and as a strategic partner in bio-refineries around the world. Celunol has recently commenced operations of the nation's first cellulosic ethanol pilot facility in Jennings, Louisiana (previous post) and expects to complete a 1.4 million gallons-per-year, demonstration-scale facility to produce cellulosic ethanol from sugarcane bagasse and specially-bred energy cane by the end of 2007. In addition, Celunol's process technology has been licensed by Tokyo- based Marubeni Corp. and has been incorporated into BioEthanol Japan's 1.4 million liter-per-year cellulosic ethanol plant in Osaka, Japan -- the world's first commercial-scale plant to produce cellulosic ethanol from wood construction waste. The combined company plans to bring its first U.S. commercial-scale cellulosic ethanol plants into production in late 2009. Range Fuels, Inc., a cellulosic ethanol company, today announced it will build its first ethanol plant in the tiny town of Soperton, Treutlen County, GA. The first plant will have a capacity of at least 10 million gallons of ethanol a year and will create over 70 new jobs for the area. Georgia Gov. Sonny Perdue told a breakfast meeting of the Georgia Agribusiness Council that Range will begin construction immediately on the $225 million plant. 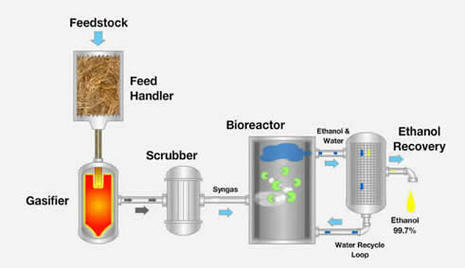 While most domestic ethanol production requires corn as a feedstock, Range Fuels' proprietary technology transforms otherwise useless products such as agricultural wastes, grasses, cornstalks and wood waste, as well as hog manure, municipal garbage, sawdust and paper pulp, into ethanol through an anaerobic thermal conversion process. The company's modular system, K2, uses a two step process to convert biomass to a synthetic gas and from there, convert the gas to ethanol. BioEthanol Japan, on January 16, became the world’s first company to produce cellulosic ethanol from wood construction waste on a commercial basis. The plant in Osaka Prefecture has an annual capacity of 1.4 million liters (about 370,000 US gallons). In 2008, it plans to boost production to 4 million liters (1 million US gallons). Celunol's technology is based on the metabolic engineering of microorganisms, a set of genetically engineered strains of Escherichia coli bacteria that can ferment both C6 (hexose) and C5 (pentose) sugars present in cellulosic biomass into ethanol, which are essentially all of the sugars found in cellulosic biomass. This plant is about one-fourth the size of the plant that Celunol is building in Jennings. It should provide some additional data that will help in the operation of the Jennings plant. I missed this announcement when it came out and am posting it because of its importance. This places the Celunol technology near the top of the technology heap, along with that of Iogen and Abengoa Biorefinery. Iogen just received some financing from the Canadian government to help in upgrading its demonstration plant. It will be a race to see if Celunol gets it US plant in operation before Abengoa Bioenergy gets its similar sized plant in operation in Spain. I have a feeling that the Celunol technology is a little better, beacause it can currently handle wood chips and the other two operate on straw. That says nothing about the cost of the three processes. Celunol is a leader in the effort to commercialize the production of cellulosic ethanol. The Company’s technology achieves high ethanol yields from cellulosic biomass at costs competitive with conventional ethanol processes using sugar and starch crops as feedstocks. The company operates the Jennings pilot facility, on a 140-acre company-owned site in Jennings LA, designed to produce up to 50,000 gallons of ethanol per year. Celunol commenced operation of its newly expanded pilot facility in November 2006. It is building a 1.4 million gallon demonstration facility to produce ethanol from sugarcane bagasse and wood, targeted for completion in mid 2007. This will be the first commercial scale cellulosic ethanol plant in the United States. Later, the Company is planning a commercial-scale cellulosic ethanol facility at the site. Celunol’s technology enables almost complete conversion of all the sugars found in cellulosic biomass. This efficiency advantage, combined with the low input cost of cellulosic biomass, results in superior economics in the production of ethanol. SunOpta Inc. (NASDAQ:STKL) (TSX:SOY) has provided an update on the four cellulosic ethanol projects which are or will be operational using SunOpta's patented technology and equipment to produce ethanol from cellulosic biomass. Key components of SunOpta's patented equipment and technology have recently been shipped to Spain for the start up of the Abengoa wheat straw to ethanol facility. This project is expected to start up in the summer of 2007 (delayed from Dec 2006) and will be the first commercial production facility in the world producing cellulosic ethanol from wheat straw. Abengoa is the largest producer of ethanol in Europe. This 5-million-liter per year (1.3-million-gallon per year) facility will be built in Babilafuente (Salamanca), Spain and is located adjacent to an existing 195-million-liter (52 million gallons per year) cereal grain to ethanol plant operated by Abengoa. A dual-stream, single-pass harvesting system to harvest corn and corn stover in two seperate streams is being developed by Stuart Birrell, an Iowa State associate professor of agricultural and biosystems engineering, and graduate students Mark Dilts and Ben Schlesser. They're working to design, build and test machinery that will harvest corn stover -- the stalks, cobs and leaves -- when farmers bring in their grain. The stover could be the source of plant fiber that feeds the next generation of ethanol plants. 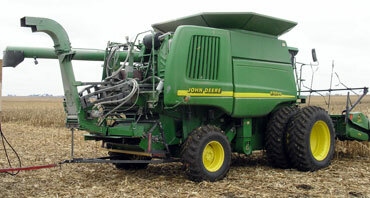 The researchers ran their latest version of a stover harvester through about 50 acres of corn near Ames this fall. The harvester dumps a crop of corn kernels into the combine's hopper and blows a crop of stalks, cobs and leaves into a trailing wagon. The researchers are developing stover attachments that can be used on standard combines. The result would be an additional cost to farmers of about $10,000 to $15,000 instead of the six figures it would take for a separate combine to harvest stover. The attachments also allows farmers to harvest grain and stover with one pass through a field. SunOpta Inc. (NASDAQ:STKL) announced that it has signed a 50-50 joint venture agreement with GreenField Ethanol Inc., formerly known as Commercial Alcohols Inc., Canada's leading producer of fuel ethanol, to develop and implement commercial scale processes for the production of cellulosic ethanol from wood chips, including the planned establishment of one or more commercial scale plants that will utilize the SunOpta BioProcess Group's patented and proprietary process solutions for the production of cellulosic ethanol. The first plant is planned to produce 40 million liters (approximately 10 million gallons) of cellulosic ethanol per year, which they claim would be the first commercial scale cellulosic ethanol plant in the world using wood chips as feedstock. Greenfield Ethanol and SunOpta are actively involved in selecting a site for the first plant in Ontario or Quebec. Subsequent plants will be in the range of 200 to 400 million liters (approximately 50 to 100 million gallons) per year capacity. BlueFire Ethanol ( OTC: BFRE) has signed a Memorandum of Understanding with MECS, Inc. as its lead Engineering Procurement and Construction contractor for the Company's cellulosic ethanol plants to serve the renewable fuels market. BlueFire's goal is to design, develop and construct 20 plants in the next 6 years totaling 1.5 billion gallons in production and approximately $2.7 billion in gross revenue by 2012 with earnings in excess of $1.6 billion. MECS will work with BlueFire and JGC to complete design and commence construction of its first cellulosic plant by the second quarter of 2007. BlueFire Ethanol, Inc. (previous post) is established to deploy the commercially ready, patented, and proven Arkenol Technology Process for the profitable conversion of cellulosic ("Green Waste") waste materials to ethanol, a viable alternative to gasoline. BlueFire's use of the Arkenol Process Technology positions it as the only cellulose-to-ethanol company worldwide with demonstrated production of ethanol from urban trash (post-sorted MSW), rice and wheat straws, wood waste and other agricultural residues. Mascoma Corporation, Cambridge, MA, and Tamarack Energy, Inc., Essex, Connecticut, have agreed to collaborate on the joint development of cellulosic ethanol facilities in New York, as well as follow-on opportunities in Pennsylvania and New England states, leveraging wood mills and other production facilities. This partnership enables Mascoma to apply its licensed and internally-developed cellulosic conversion technologies, processes, engineering and design expertise, to Tamarack Energy’s alternative energy development, permitting, operational, and financing abilities. Mascoma's R & D (previous post) has the goal of bioengineering the ethanol-producing microbes so that they will collapse the many biologically mediated steps involved in ethanol production into one simple step. Broin Companies, the nation’s largest dry mill ethanol producer, plans to build a cellulose-to-ethanol production facility in the state of Iowa with a completion date expected in 2009. 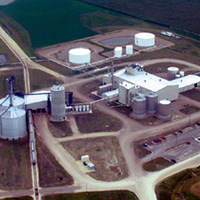 Voyager Ethanol, shown left, will be converted from a 50 million gallon per year (MGPY) conventional corn dry mill facility into a 125 MGPY commercial scale bio-refinery designed to utilize advanced corn fractionation and lignocellulosic conversion technologies to produce ethanol from corn fiber and corn stover. Broin Companies has applied for matching grant funds through the U.S. Department of Energy (DOE) to assist with the project. Mascoma Corporation, the leader in cellulosic biomass-to-ethanol development and production, has raised $30 million in its second round of venture funding. Today ethanol in the U.S. is made primarily from corn, a resource with multiple uses with limits to its long term capacity. Ethanol made from cellulosic biomass (e.g. grass, wood, and various agricultural and forestry wastes) takes advantage of significantly lower raw material cost, more plentiful and varied feedstocks, and expands the potential for ethanol to blend with and displace gasoline with a cleaner, renewable, domestically-produced liquid fuel. Dyadic International, Inc. (AMEX:DIL), has signed a three-year research and development (R&D) agreement and a stock purchase agreement with Abengoa Bioenergy R&D, Inc. (ABRD). Under the terms of the agreement, Abengoa Bioenergy will invest $10 million in Dyadic, for which it will receive 2,136,752 shares of Dyadic Common Stock. Dyadic will use the proceeds from this private sale to fund R&D obligations called for in the agreement, which has as its objective the development of a cost-effective enzyme production system for commercial application in Abengoa Bioenergy’s bioethanol (cellulosic ethanol) production process. The R&D agreement calls upon Dyadic to use its proprietary technologies to develop one or more enzyme mixture manufacturing systems customized to ABRD’s proprietary biomass substrates. According to the Daily Yomiur Online Honda Motor Co. is to mass-produce flex-fuel compact cars that can run on 100 bioethanol, becoming the first Japanese automaker to do so. The company will first start producing and selling the vehicles in Brazil, the top nation in the world in terms of the use of bioethanol in automobiles. Of the 65,000 or so Civic and Fit models produced in the company's plant in Brazil, the company will switch production of about 30,000 to bioethanol cars. This announcement is complimentary to their announcement earlier this week that they are developing a process to produce cellulosic ethanol. DesMoinesRegister.com: Energy Secretary Samuel Bodman said his department expects to issue loan guarantees next year for the first cellulose ethanol projects. Construction will take an additional two to three years, he said Thursday. Private companies closely guard their production costs, but Bodman has been told privately that some have lowered the cost of making cellulosic ethanol to $1.50 a gallon. He did not identify the companies. “The goal is to get it down to commensurate with corn, which is $1.10,” he said. This seems contrary to some announcements reported in The Energy Blog which indicated that some plants would start operation this year and more in the following years. Xethanol Corporation's (AMEX: XNL) mission is to convert biomass that is currently being abandoned or land filled into ethanol and other valuable co-products, such as xylitol. They are committed to the production of ethanol and related products in manufacturing facilities close to the major urban markets for those products, using locally available raw materials. Their strategy calls for the use of locally available biomass rather than corn as the primary raw material for ethanol production. Corn is currently the dominant raw material for ethanol production. As a result this production is now concentrated in the Corn Belt - thousands of miles from the areas of highest ethanol demand on the Atlantic, Gulf and Pacific coasts. Please see my extensive comments at the end of this post. On August 15 the company reported record sales of approximately $3.2 million on approximately 1.3 million gallons of ethanol sold. There were no sales during the second quarter of the prior year. The Company also reported record gross profit for the quarter of $673,189 or 21.0% of sales. Panda Ethanol Inc. announced that its Hereford subsidiary has successfully completed $188 million of debt financing on its 100 million gallon ethanol plant in Hereford, Texas, a cattle town in the Texas panhandle. The company will immediately begin facility construction on the 380-acre site and anticipates ethanol production to commence in the second half of 2007. The first-of-its-kind facility (?? I have heard of others) will generate the steam used to manufacture ethanol by gasifying more than 1 billion pounds of cattle manure a year making it one of the most fuel efficient ethanol refineries in the nation. Once completed, it will be the largest biomass-fueled ethanol plant in the United States.